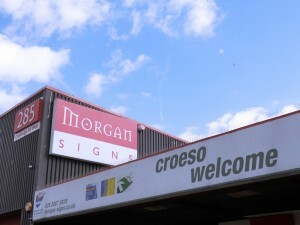 With ISO14001 certification and a group-wide commitment to recycling and environmentally sound initiatives; investment in additional digital print capacity for high profile Cardiff sign and graphics company, Morgan Signs, stood a good chance of pointing towards a latex printer, but it wasn’t just for green reasons that it chose a Mimaki JV400. 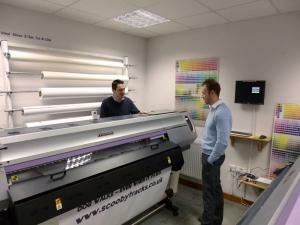 Having invested in a Mimaki JV3 in the mid 2000’s, Morgan Signs increased its capacity in recent years with a JV33 and has a quiver of Mimaki cutting plotters, laminators and other high end kit that serves both its sign making arm and the newly formed PopIn Vehicle Graphics that specialises in fleet liveries and vehicle branding. 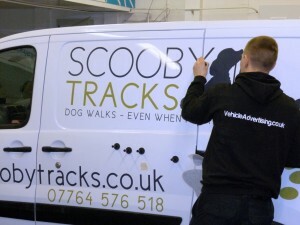 PopIn Vehicle Graphics is based in the same, substantial premises as the rest of Morgan Signs’ operation, but has an impressive climate controlled double vehicle bay that is ideal for preparation of vehicles and installation of vinyl graphics. Formed in early 2013, the subsidiary focuses entirely on vehicle liveries, employs a team of four specialist fitters and is headed up by MD Craig Lovegrove. “Although it wasn’t much of a decision to stay with Mimaki when we were looking at a new wide format printer, there was still a distinct decision making process that we went through,” Lovegrove recalls. setup and ISO certification, we become an attractive proposition.” The Mimaki JV400 latex printer used within the vehicle branding operation ticks a multitude of eco positive boxes, but that’s just one of the many benefits that the boss of PopIn Vehicle Graphics is finding. “The smooth gradients, drop shadows and colour matching we’re getting from the Mimaki RasterLink RIP software is so good that our production time has sped up even more,” says Lovegrove. Simple, but very effective applied vinyl jobs that may once have been constrained to a limited range of off-the-shelf cut vinyl colours are now printed, laminated, cut out and applied in a seamless process, tied together with Mimaki’s software package for the latex printer and cutting plotter. Morgan Signs also aim to uphold its social and environmental responsibilities.